Pep Guardiola and Jose Mourinho will renew their long-standing rivalry on Sunday night as the red and blue halves of Manchester collide at the Etihad Stadium. 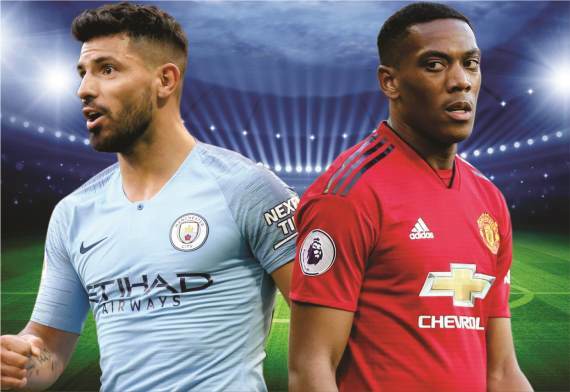 The Manchester derby always produces fireworks and with both sides desperate to claim bragging rights, we should be in for a cracking contest. The Citizens are two points clear at the top of the Premier League table, while United are languishing in seventh place, nine points behind their city rivals. Manchester City are short-priced favourites to beat Manchester United. Guardiola’s men have made a blistering start to the season that sees them top of the table on 29 points, two ahead of Chelsea and Liverpool, after 11 games. The Premier League champions have scored the most goals (33) so far this season while they’ve also been the best defensive side, having conceded just four – with goalkeeper Ederson keeping seven clean sheets. Guardiola’s side have won all six of their matches at the Etihad Stadium and will be hoping to extend their winning streak against United. However, City haven’t beaten their bitter rivals at home in their previous three meetings, with their last win at the Etihad coming in November 2014 when Sergio Aguero scored the game’s only goal. City will be without playmaker Kevin de Bruyne for more than a month after the Belgian suffered knee ligament damage against Fulham in the League Cup at the beginning of the month. Although not having the 27-year-old is a huge blow, Guardiola’s side have been getting on well without him, with Bernardo Silva stepping up in his absence. The Portuguese has contributed greatly to City’s unbeaten start to the domestic campaign, scoring three goals and forming a formidable midfield partnership with David Silva and Fernandinho. The Citizens have goalscorers all over the pitch, but Raheem Sterling and Aguero are their main source for goals. The duo have been involved in 11 goals each so far in the Premier League this season. Sterling has six goals and five assists from nine games, while Aguero is City’s top scorer, netting seven times and racking up four assists. Manchester United go into Sunday’s clash as heavy underdogs with their odds of winning the derby at a hefty 6/1. But just like last season, City were strongly fancied to beat United at the Etihad, but Mourinho’s men rewrote the script and claimed an emphatic 3-2 victory thanks to a masterclass by Paul Pogba. United’s previous trip to the Citizens saw them earn a goalless draw and in the 2015/16 campaign, they won 1-0 at the Etihad – their first win away to their fiercest rivals since December 2012 – thanks to Marcus Rashford’s brilliant goal, which saw him become the youngest Manchester derby goalscorer in the Premier League era. It’s fair to say that the Red Devils haven’t been at their best this season, however, Mourinho’s men are enjoying a resurgence in form, going unbeaten in their last four Premier League matches, winning three times. In that run, they claimed a 3-2 comeback victory at home to Newcastle, played to a thrilling 2-2 draw at Chelsea and recorded back-to-back 2-1 wins over Everton and Bournemouth – handing the Cherries their first home defeat of the campaign. With United gathering momentum and Anthony Martial hitting top form with five goals to his name, Mourinho will be optimistic his side can get a positive result on Sunday. But if United are to get anything from this game, they’ll need Pogba to be at his very best. The midfield powerhouse showed his class at the Etihad last season when he scored a brace and inspired United to a 3-2 comeback victory. The Frenchman needs a performance reminiscent of that if United are to have any hope at all. Ederson; Walker, Stones, Laporte, Mendy; Fernandinho, D. Silva, B. Silva; Sterling, Aguero, Mahrez. De Gea; Young, Smalling, Lindelof, Shaw; Pogba, Matic, Fred; Mata, Rashford, Martial. Even without KDB, Manchester City should prove too strong for United here. I can’t see Chris Smalling and Victor Lindelof coping with City’s lethal attack. With the odds too short on the straight home win, I suggest backing Sterling to score anytime in the match and City to pick up three points. Sterling has scored in four of City’s last five home games in the league.